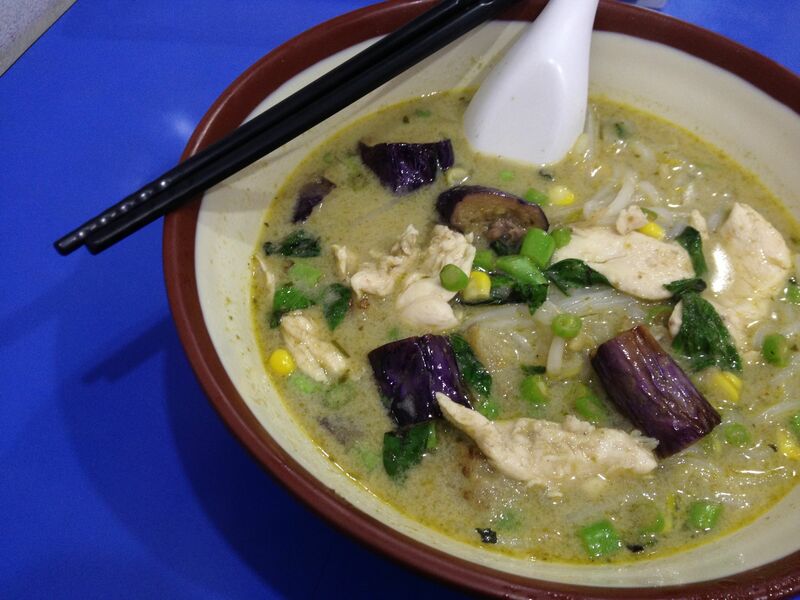 green [xindian] line (新店線) | 更臭更好吃. 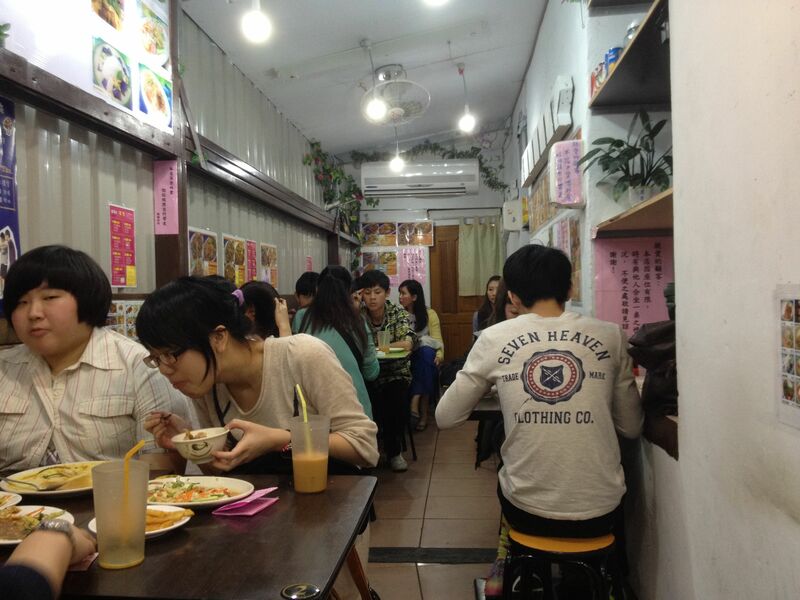 One of the things I like to take out of country visitors to eat is all-you-can-eat “mala guo” aka spicy hotpot (麻辣鍋). 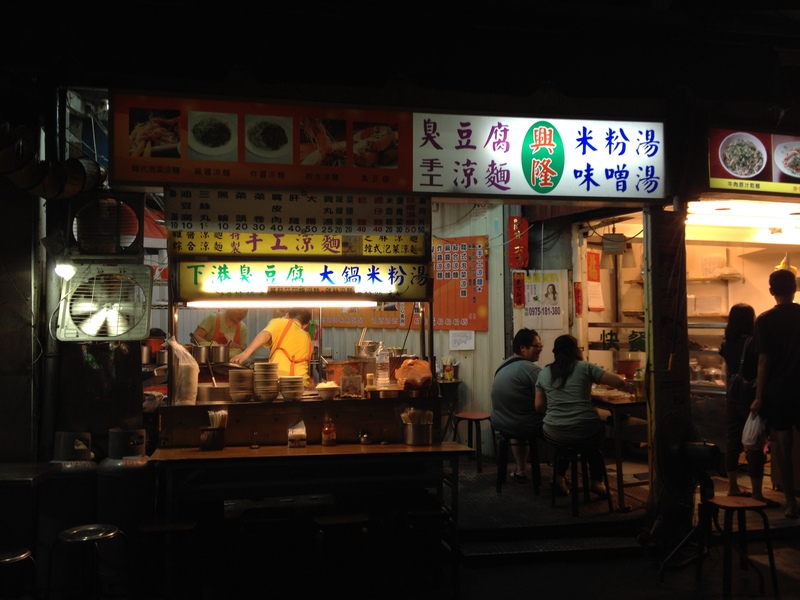 Usually I like to go to Ma La (馬辣), which has two locations: one in Gongguan and another in Ximending (西門町), but if you don’t make reservations a few days in advanced, you’re likely to only get reservations for after 9pm. 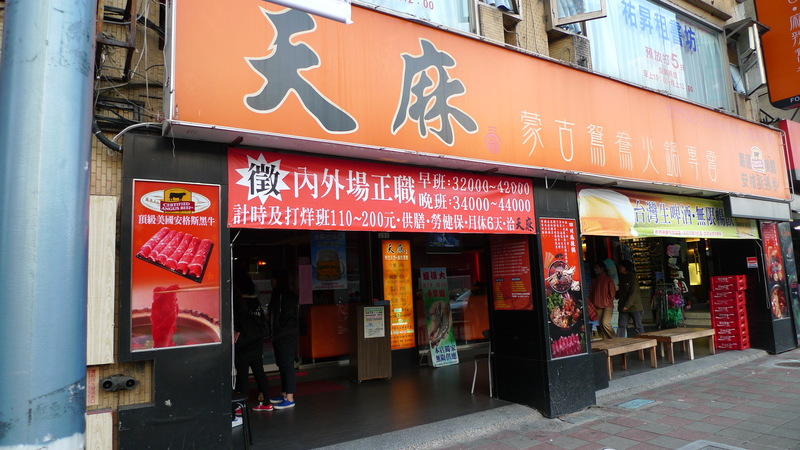 My neighborhood backup all-you-can-eat hotpot place is Tian Ma Mongolian Hot Pot (天麻蒙古鴛鴦火鍋專賣), which is under the same group as Ma La. Tian Ma is in Gongguan actually right down the street from the Gongguan location of Ma La. I would recommend reservations a few days in advanced, just to be safe, but usually you can call Tian Ma the day of and get reservations around the time you want. Be aware that the colder and rainier the day, the harder it will be to get a reservation. Tian Ma has two floors. I think I’ve only ever been seated on the first floor once. All other times I’ve been seated on the basement floor. 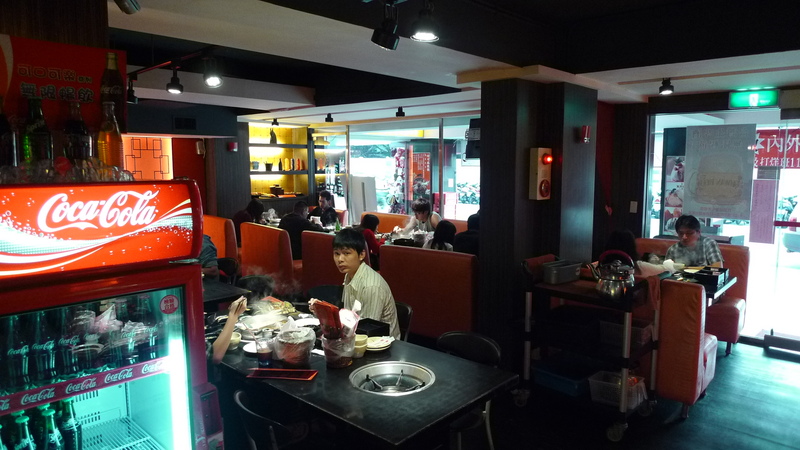 Like your typical hotpot place, each table is equipped with a burner for your hotpot. 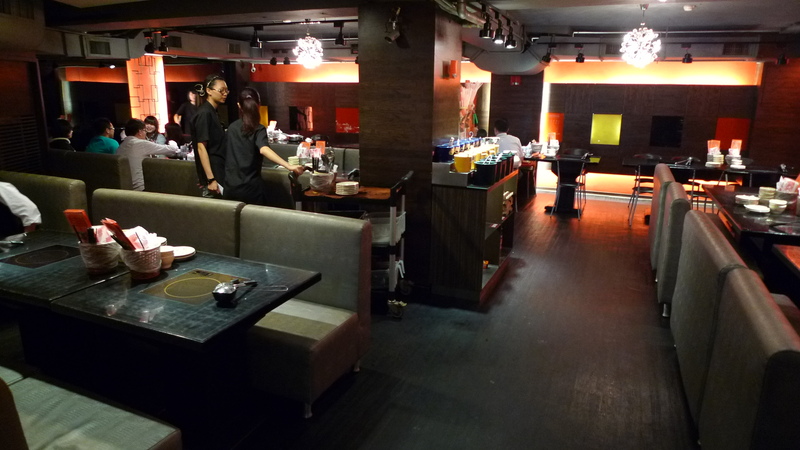 The basement floor tables are equipped with electric burners, while the first floor tables has gas burners. Really, I don’t think the type of burner you have makes a difference. The only reason I kind of prefer sitting on the first floor is because that is where all the food is. 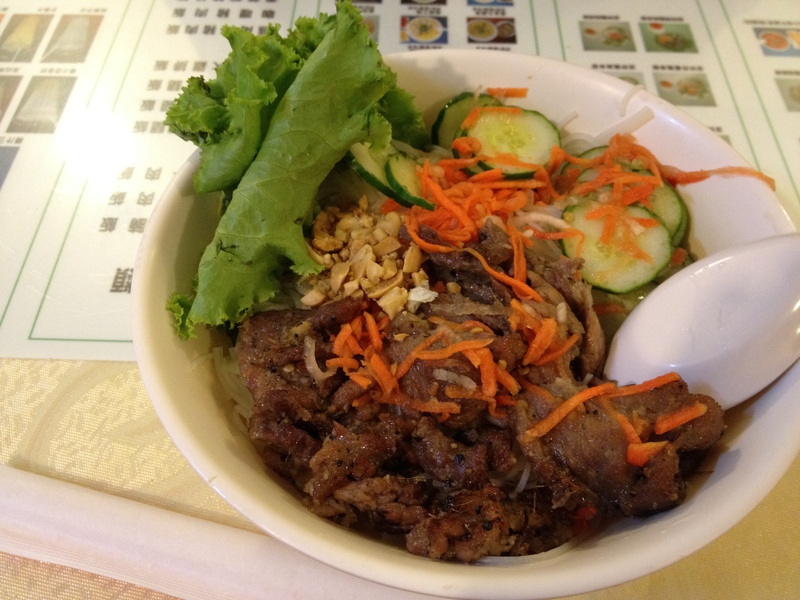 First thing you do when you sit down is order the type of broth you want in your hot pot. 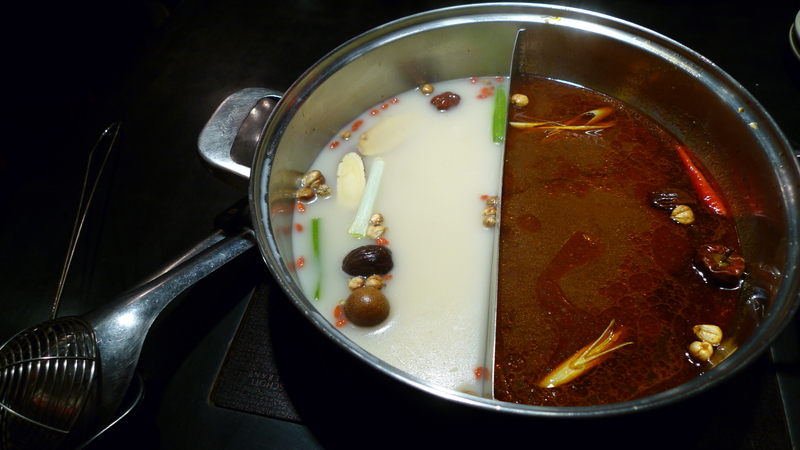 You can either get one huge pot of one broth, or you can get a split pot of two flavors. 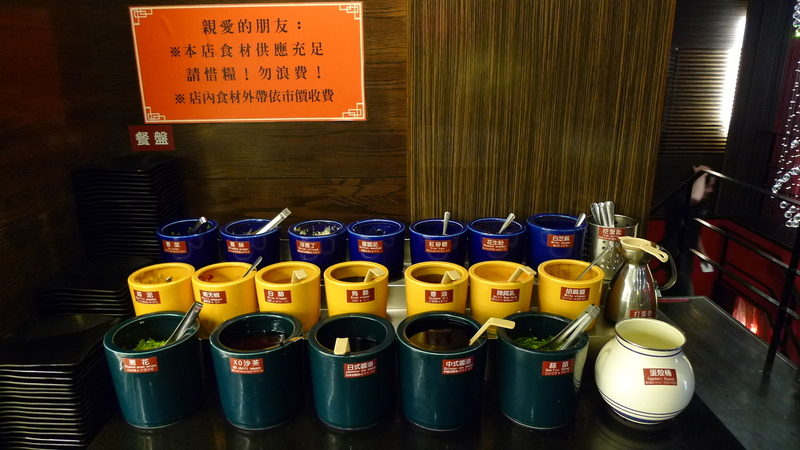 We got the Healthy Mongolian Pot (蒙古養生鍋) and the Sichuan Spicy Pot (四川麻辣鍋). Be warned, if you like spicy, but can’t handle super spicy the Sichuan Spicy Pot is really spicy, and also my favorite. 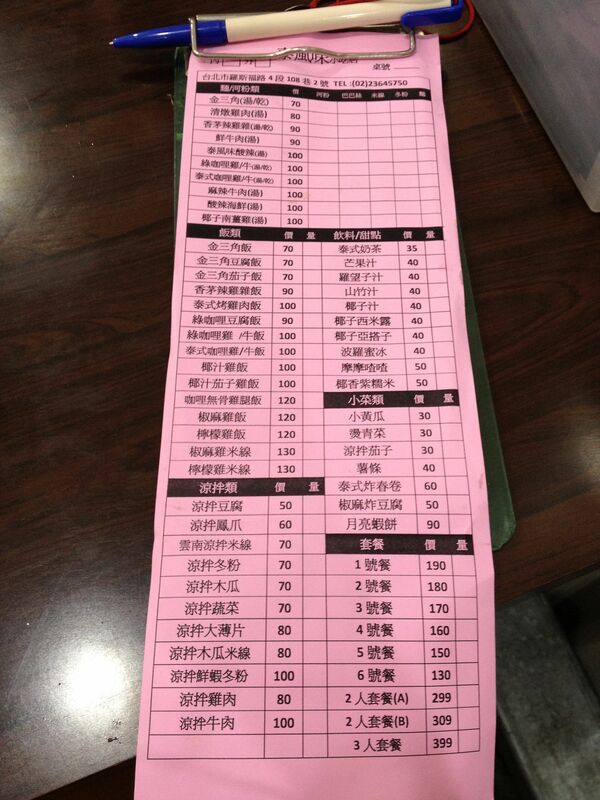 Everything at Tian Ma is self serve except for the meats and hotpot broth. 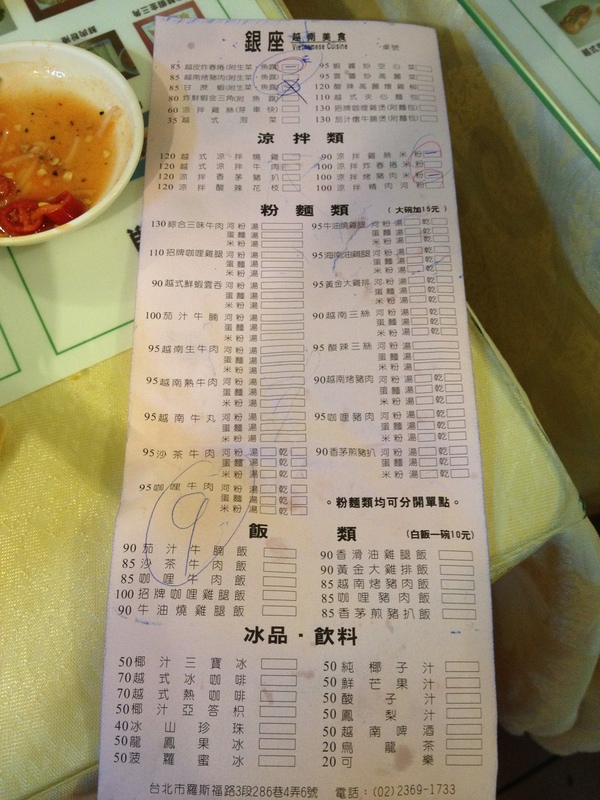 When you sit down you can order up to 5 different types of meat at a time. They have beef, pork, lamb, and seafood to order via waitstaff. 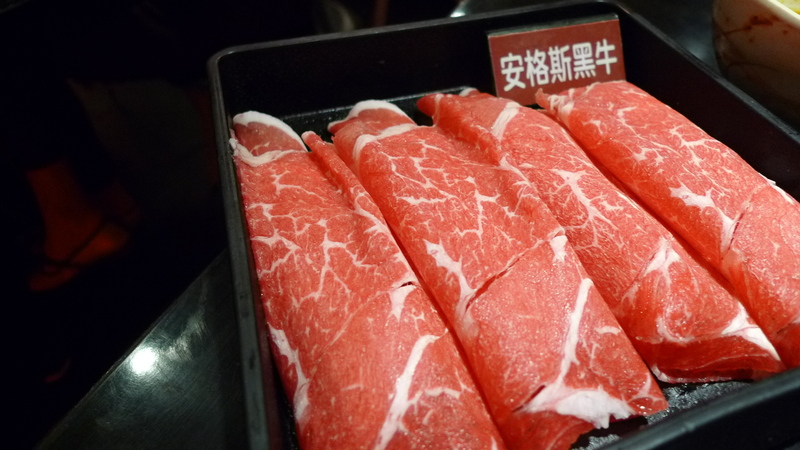 All the meat is pretty tasty. 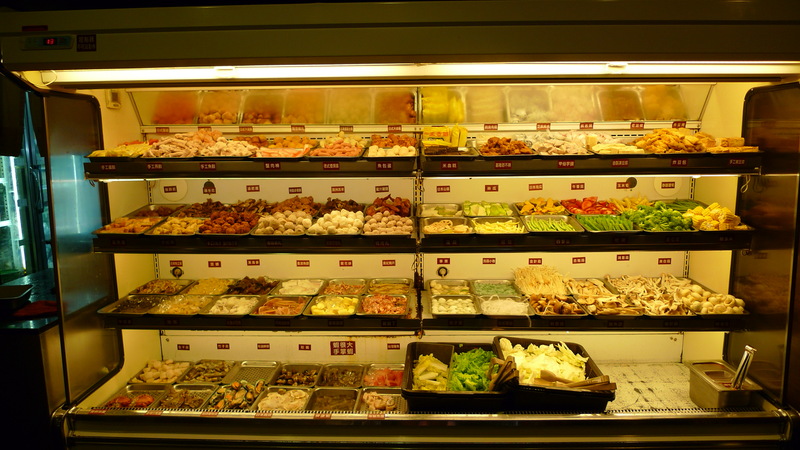 They have a pretty good selection of vegetables, seafood, meatballs, tofu products, etc. to choose from. They are also pretty good at keeping everything well stocked. In the event what you want is out or running low, just tell the waitstaff. Among my favorite things are the enoki mushrooms (金針菇), fishball with fish eggs (魚包蛋), tofu skin (豆皮), pumpkin (南瓜), and baby corn (玉米筍). 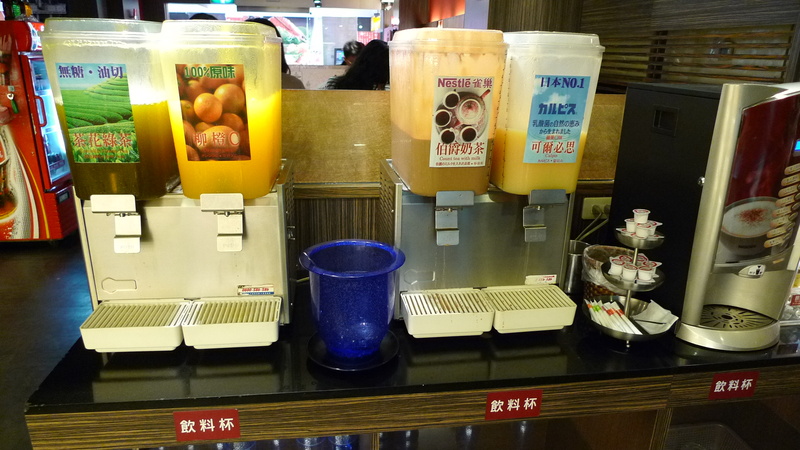 There are a lot of options for drinks. You can drink juice, tea, or coffee. 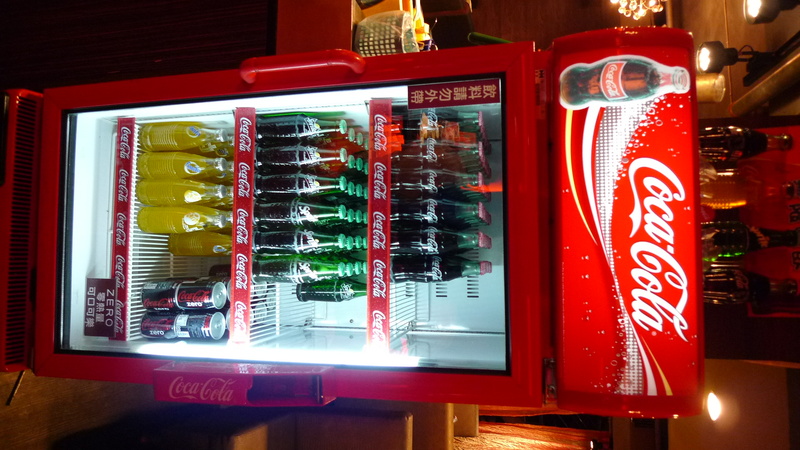 You can drink various types of Coca-Cola products. 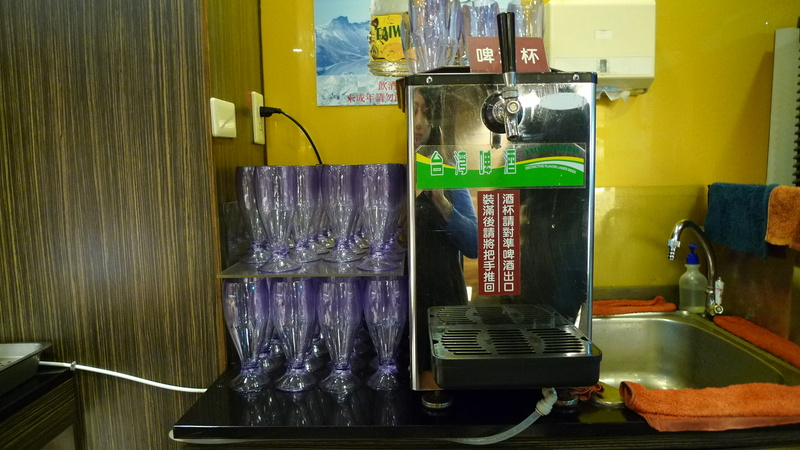 Or you can help yourself to all-you-can-drink Taiwan beer. Don’t forget to mix your sauce! I usually end up with a garlic, onion, green onion, chili pepper, soy sauce concoction. 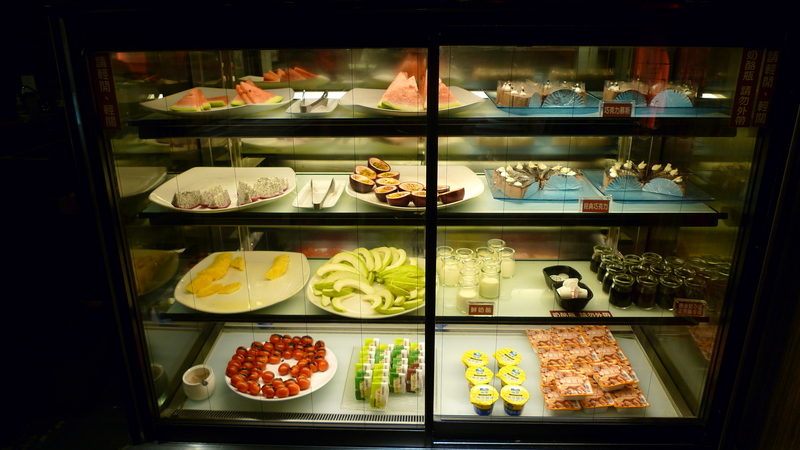 For dessert they have a fridge filled with various fruits and desserts. I love the milk pudding (鮮奶酪), so creamy and delicious! 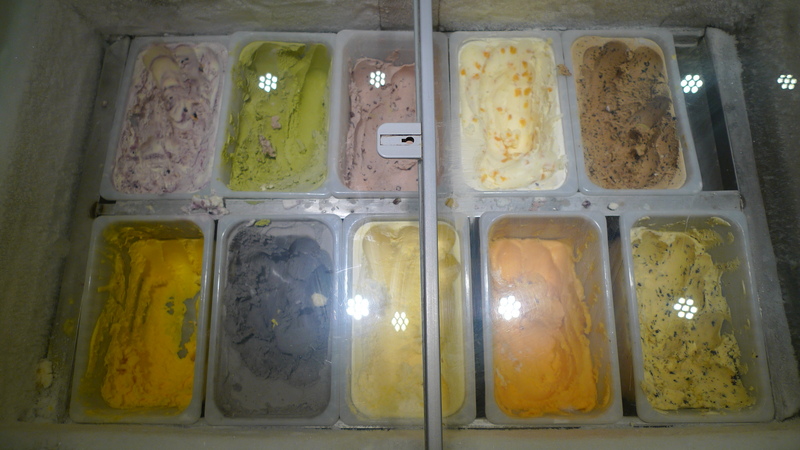 They also have all you can eat ice cream! 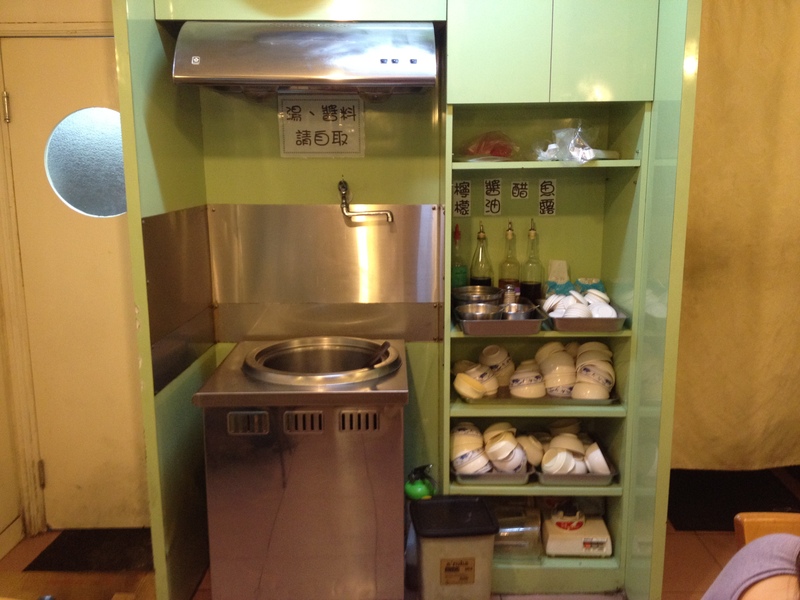 I think the only difference between Ma La and Tian Ma is that Ma La has Häagen-Dazs ice cream, and Tian Ma does not. 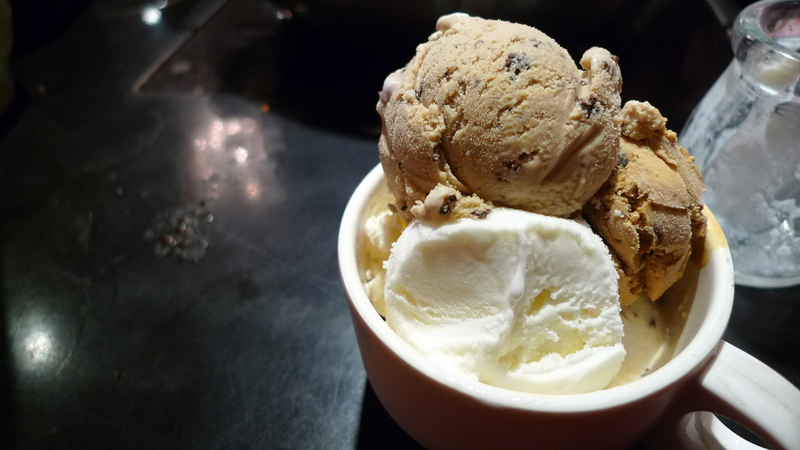 Tian Ma carries Mövenpick, 卡比索, Meji, and Sentia brands of ice cream. I very much like Tian Ma. If you go on a weekend it ends up being about 550NT per person and it’s totally worth it. Ron called me for dinner and said he wanted pasta. 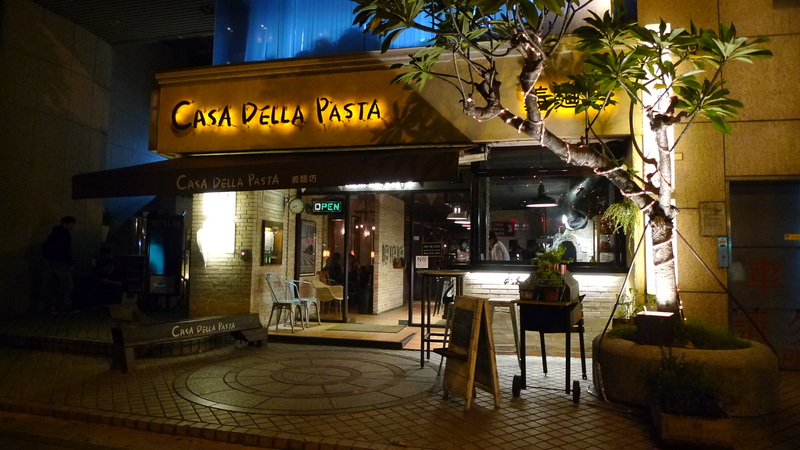 I don’t know of a lot of pasta places around Guting, but Ron had passed by Casa Della Pasta on Jinshan Rd. 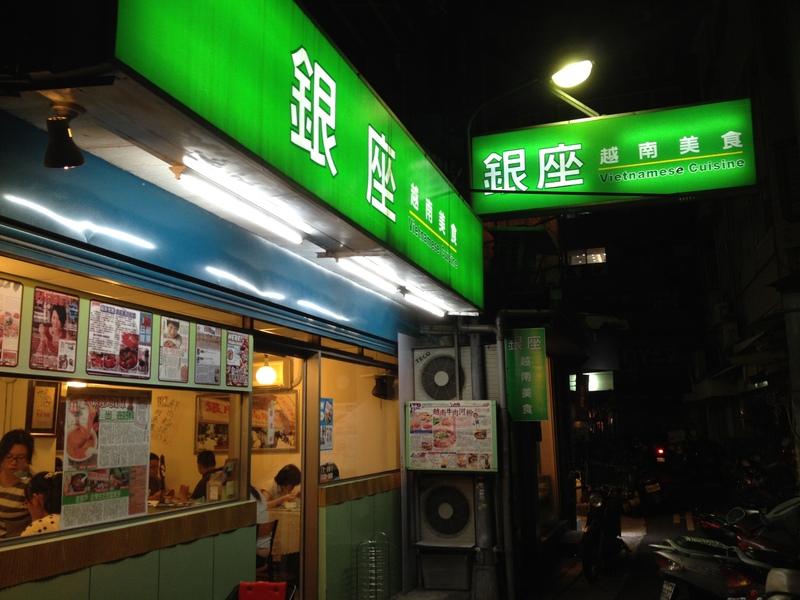 (金山路) near Shida (師大) so we decided to try it out. Casa Della Pasta (Shida Store) is located right next door to Roxy 99 and Twiice Night Club (formerly 9%). 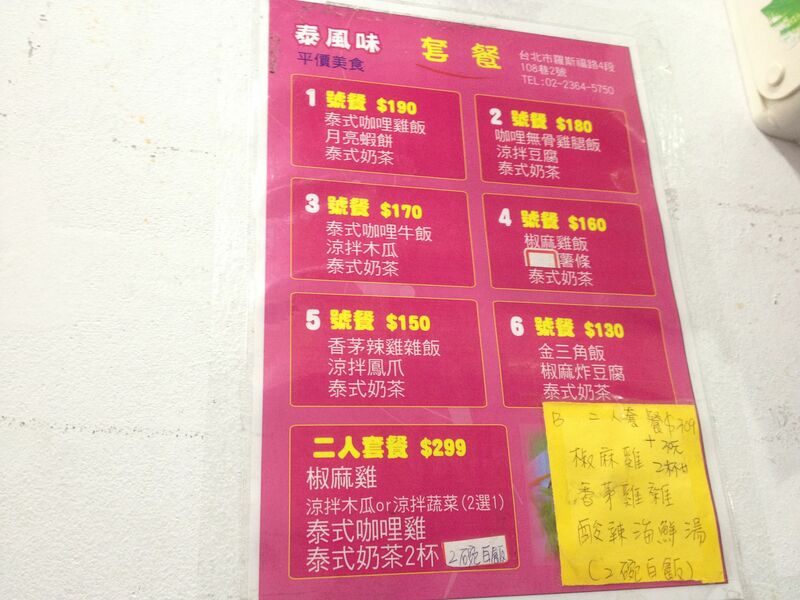 According to their business card they have 4 locations in Taipei. On a Saturday night at 8pm the restaurant was pretty full, but we didn’t need a reservation for two and were immediately seated. 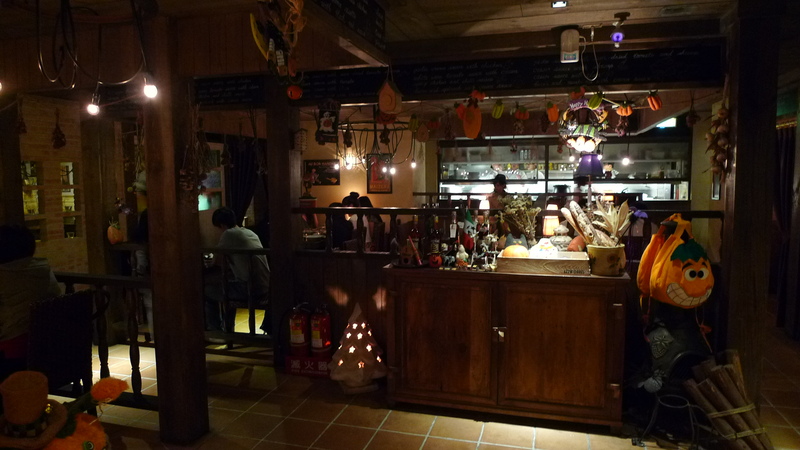 The inside of Casa Della Pasta is pretty nice: pretty cute and homey, nice place for a date maybe. There is a large window at the back of the restaurant into the kitchen so you can see what’s going on. They also have some Halloween/fall decorations up to add some festive zest. 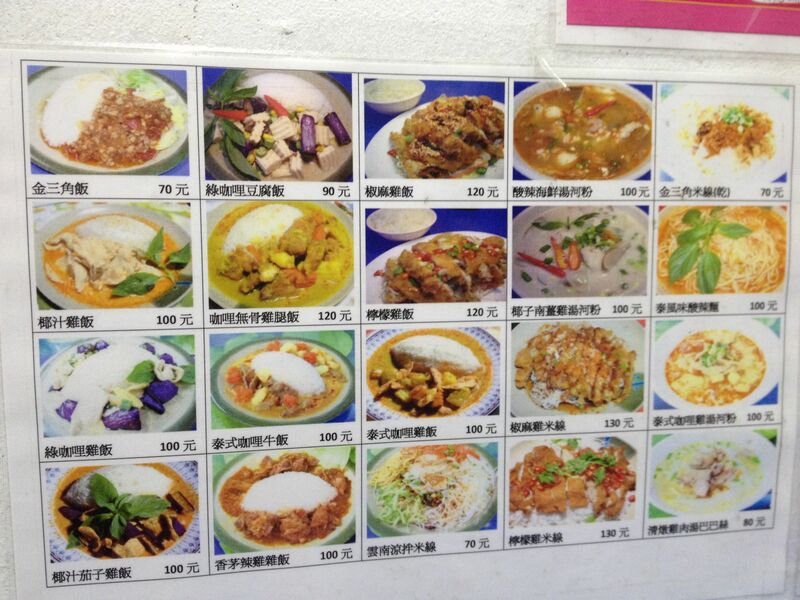 The menu has a lot of variety. I saw pizza, salad, risotto, gnocchi, and other mains in addition to the long list of pasta. 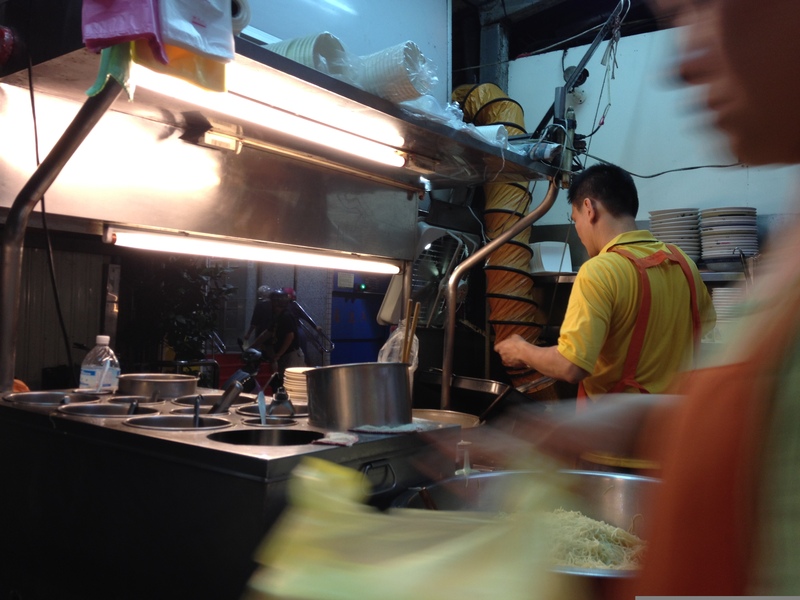 All of their pastas come with the choice of spaghetti (細麵) or penne (管麵). 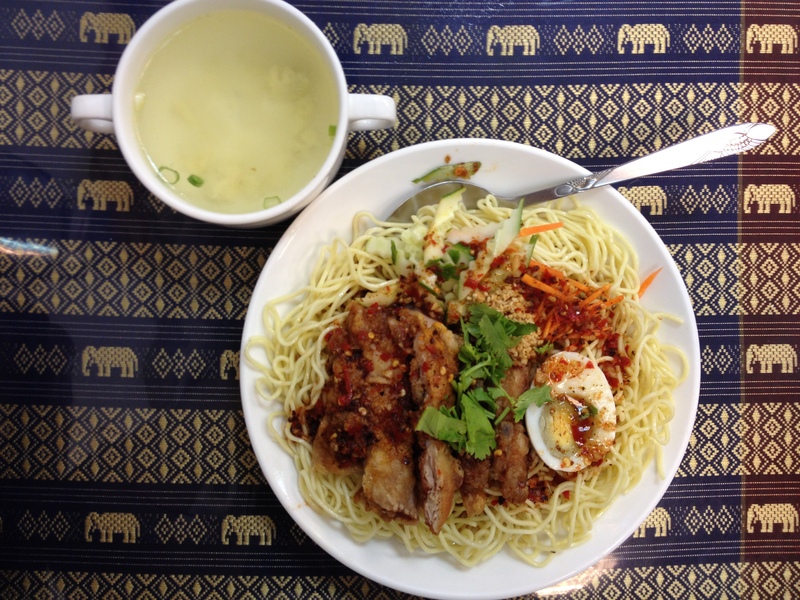 You can also make your meal a set meal for an extra 90NT. I think the set meal come with salad and a drink, but I’m not sure; Ron and I both chose to just order a la carte. 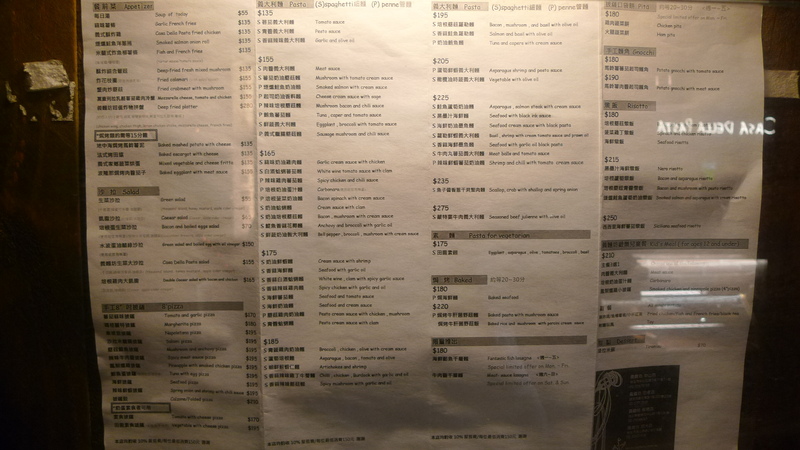 I asked the waitress for a recommendation and she suggested the Smoked Salmon with Cream Sauce (煙燻鮭魚奶油麵) for 155NT, which she noted is their signature dish. Ron and I both decided to try it. I liked this dish. The cream sauce was pretty light and they weren’t heavy handed with it, which I liked. The sauce had a nice garlicy taste to it, but wasn’t overpowering. 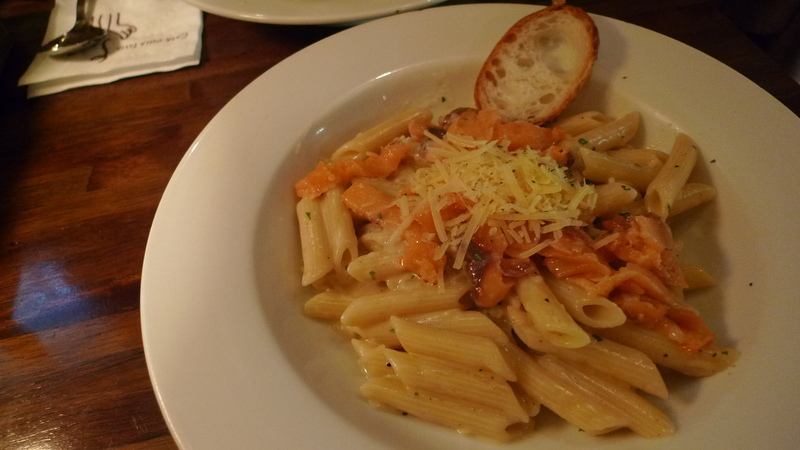 The smoked salmon cooks a little while on the hot pasta. The waitress told us when ordering this that the salmon would not be cooked all the way, which to me was a given, but nice to be warned just in case. The pasta was cooked well; a nice al dente. I’m pretty sure both the pasta and smoked salmon are not made in house. The pasta didn’t taste like it was freshly made and for 155NT I doubt it is. There was also a small piece of french bread and shredded parmesan that accompanied the pasta. Overall, pretty tasty. I’d get it again. For the price this place isn’t bad. I’m curious about their meat sauce because that’s usually what ends up being most disappointing at Italian restaurants in Taiwan. 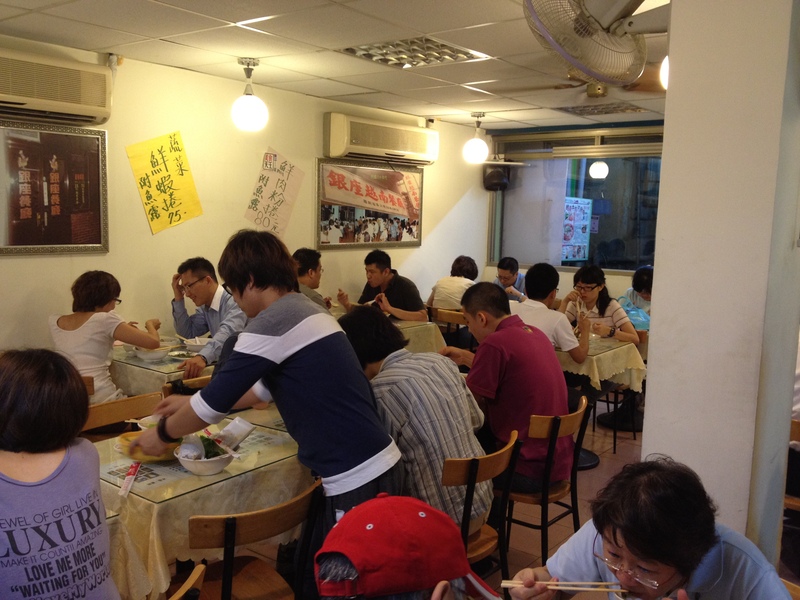 The service was good and one of the waiters speaks very good English for those who don’t really speak Mandarin. In comparison with Luna D’Italia and Papa Gio’ this place is less authentic and less fancy, but the price reflects that. 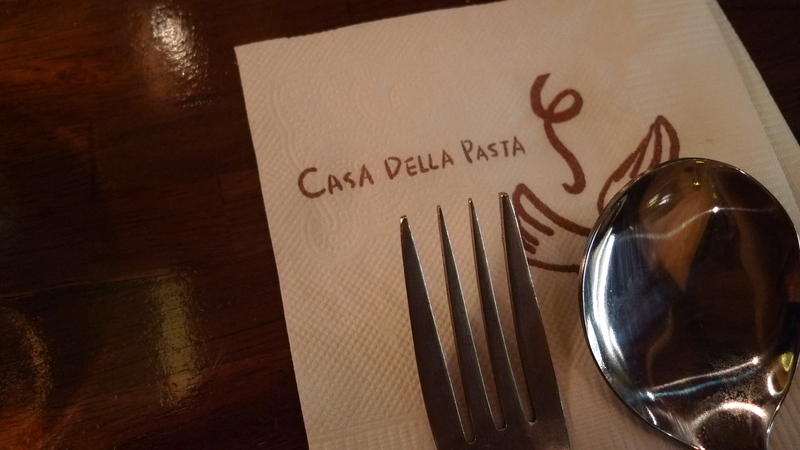 I’d say the average meal at Casa Della Pasta only costs around 300NT if you decide to get the set meal, cheaper if you order a la carte like we did. Would I come back here? Yeah, I’d give it another go. Was it super spectacular? Not really, but it’s good enough. 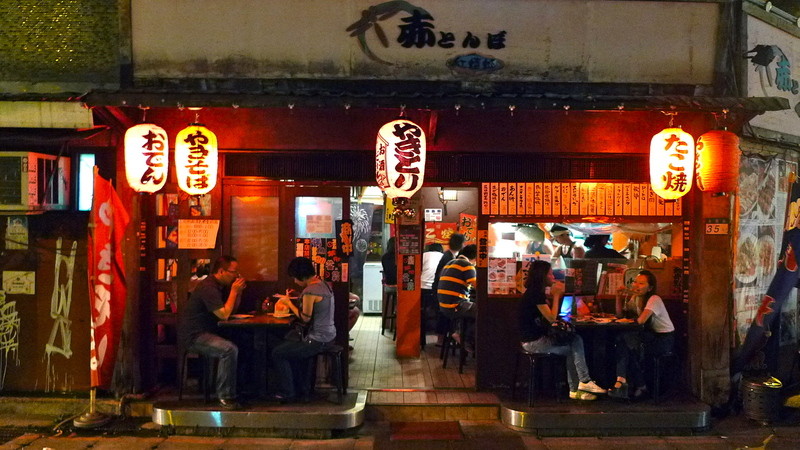 For the past two years I have been walking passed 紅蜻蜓食事處 on Yongkang St. (永康街) and always thought, I want to eat here, as I love Japanese izakaya places. Finally after two years, my friend Ashley took me. 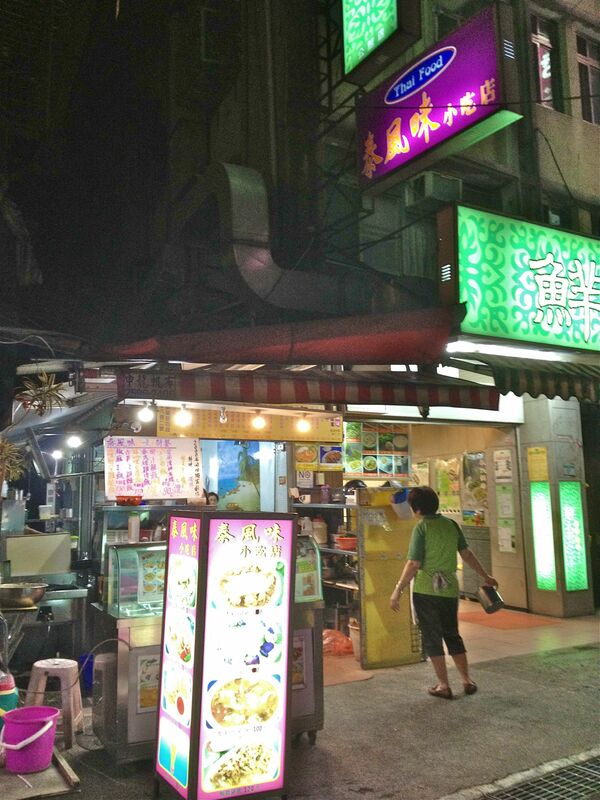 紅蜻蜓食事處 is located on Yongkang St. past the park, across from the Dante’s Coffee, at the corner of Yong Kang St. Lane 37. 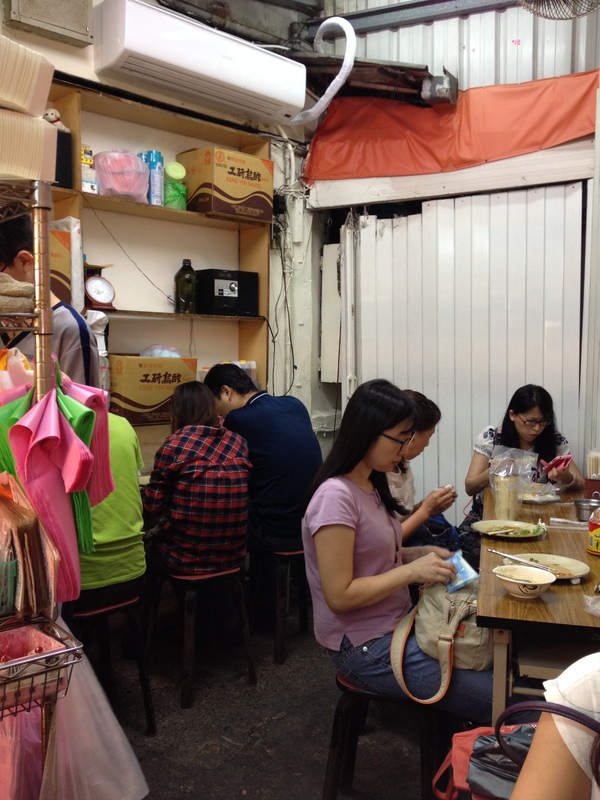 One of the reasons I never made it to 紅蜻蜓食事處 (roughly translated as Red Dragonfly Restaurant) is because it’s tiny and usually full. Ashley and I met at Yongkang after work around 7:30pm on a Wednesday night and managed to grab the last table, which happened to be one of the two tables they have outside by the entrance. 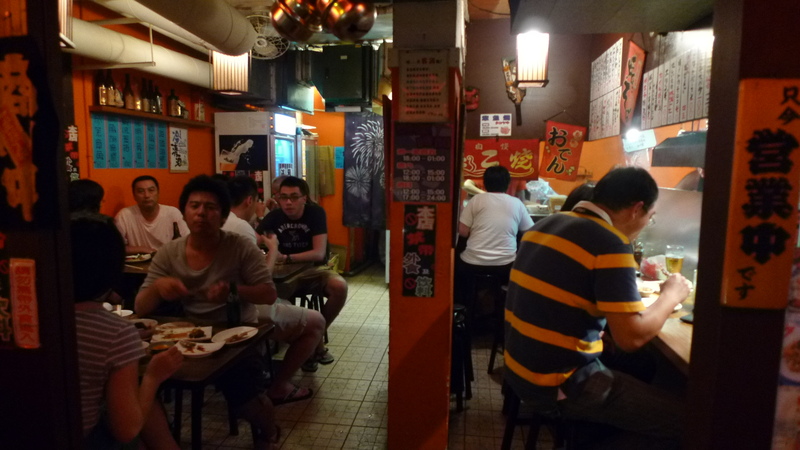 In total, 紅蜻蜓食事處 has only 4 or 5 tables inside and the bar at the grill that in total probably seats around 25 people. Outside, where we sat, they have two tables that seat 2 to 3 people. 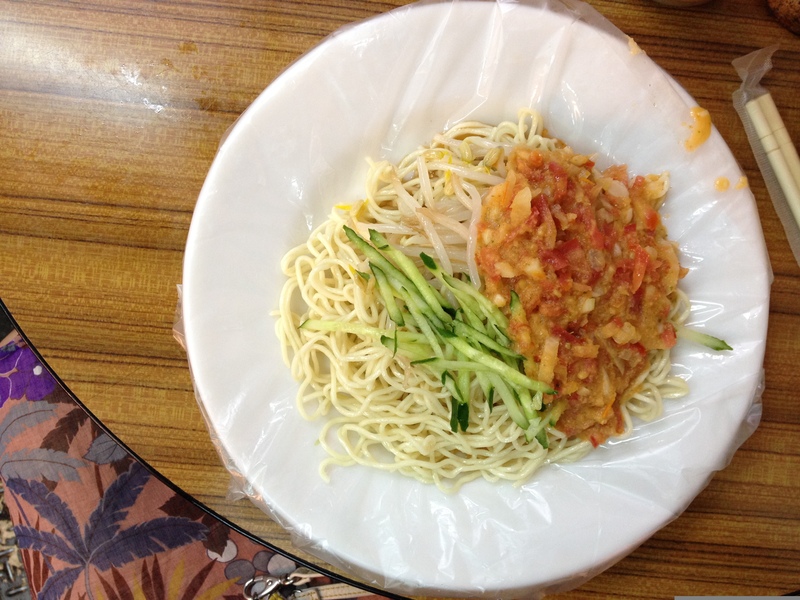 I ordered the curry korokke, aka curry croquette, (咖哩可樂餅) for 90NT because I love curry and I love potatoes. These were pretty tasty. For 90NT you get two lightly fried croquettes. 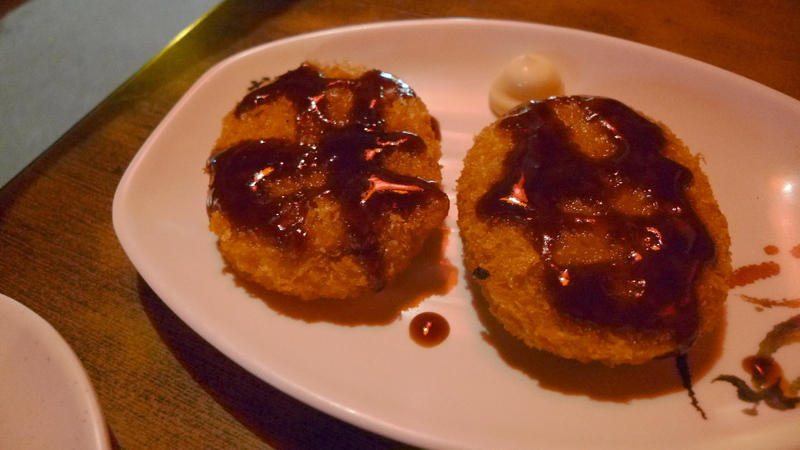 The curry flavor was just enough and the sauce on top, which tasted like katsu sauce, added a nice sweet/tartness. 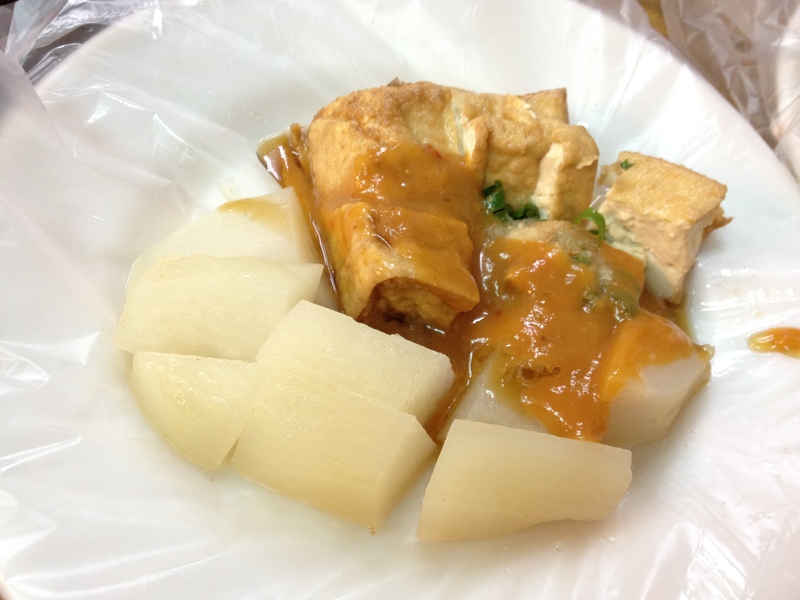 Ashley recommended the cold tofu with mountain yam (山藥冷豆腐) for 120NT. This was probably my favorite thing we had. The cold tofu with mountain yam comes with a chunk of cold tofu with ground mountain yam, raw egg yolk, and nori (dried seaweed) shavings with some kind of light broth. We’re pretty sure you’re meant to mix it all up and eat it. Warning, this is not going to be for everyone. 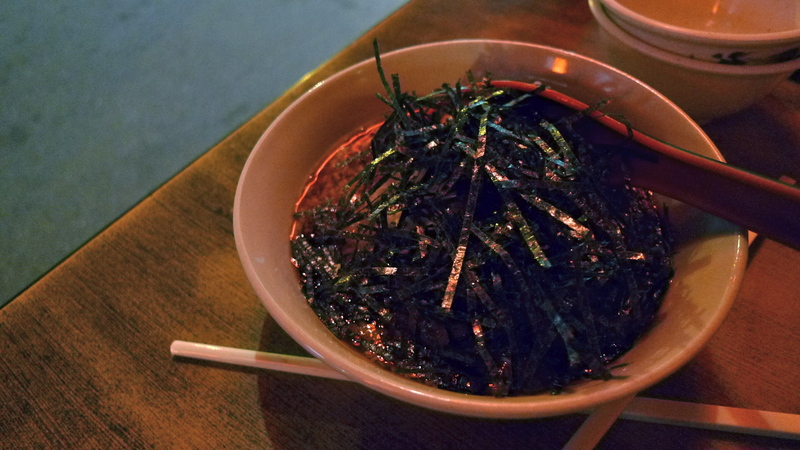 Mountain yam has a very slimy texture when raw, much like the sliminess of okra. On top of the raw egg, this is pretty slimy, but I really like that. 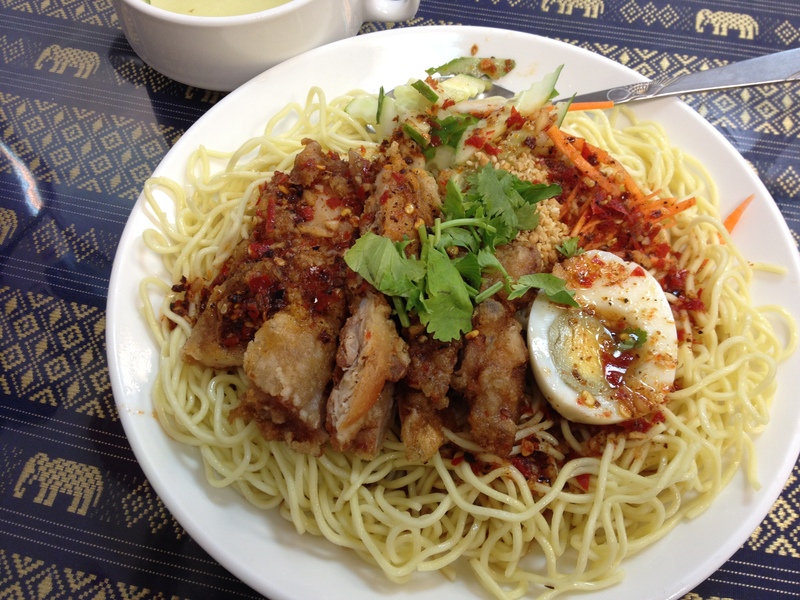 To me, all the flavors work really well together, but again, this dish is not for everyone. 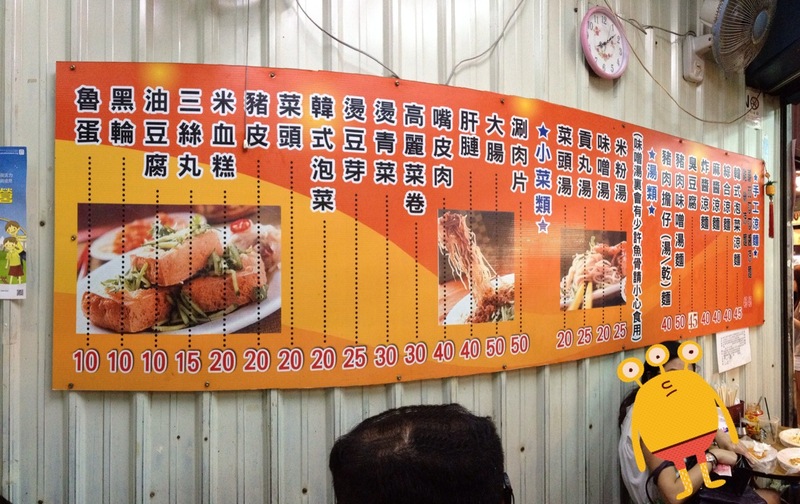 One order of the chicken leg skewers (雞腿肉 – 3串) comes with three skewers for 90NT. 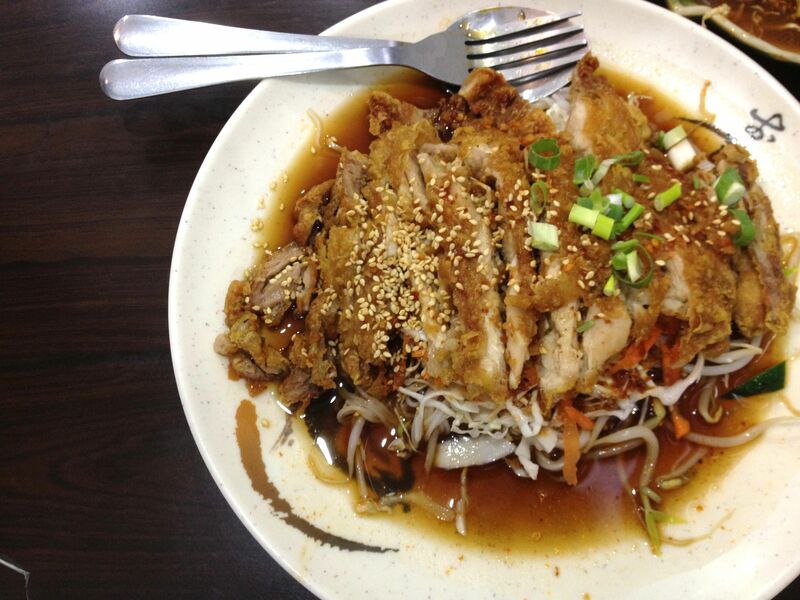 The chicken was deliciously tender and marinated in what tasted like teriyaki. Very good. 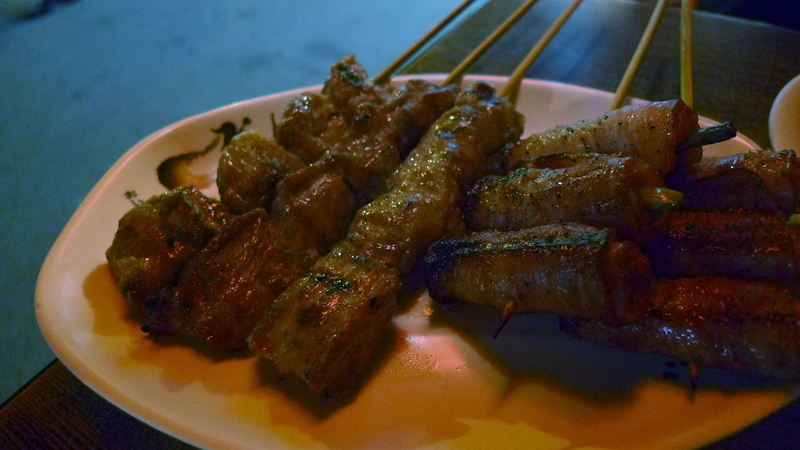 Ashley picked the meihua pork skewers (梅花豬肉) 3 skewers/90NT (left). I thought the pork was okay. I think of the skewers we ordered it was my least favorite, but it was still good. It was lightly seasoned with salt, but I kind of felt like it was tougher than I generally prefer. 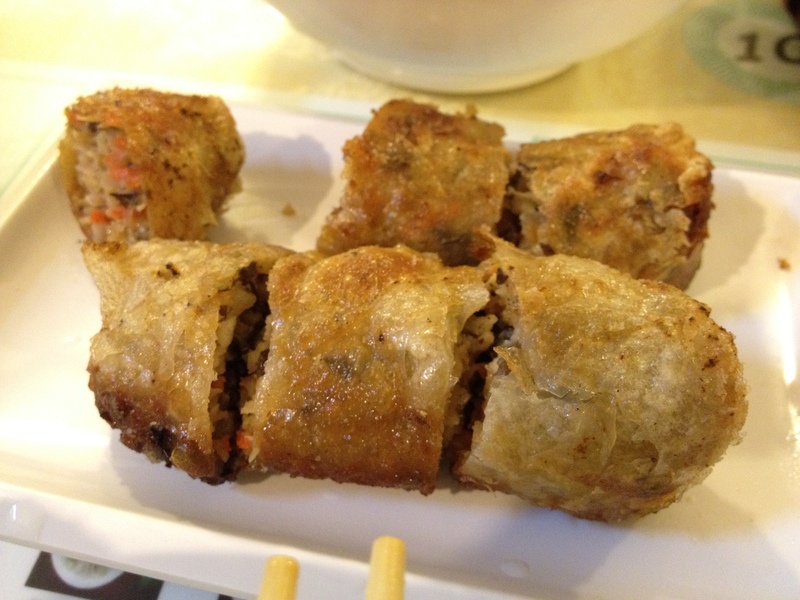 We also got bacon wrapped asparagus (培根蘆筍), which came with two skewers (3 pcs. each) for 100NT. I loved these. I liked the saltiness from the bacon and the crunchiness from the asparagus. So good. 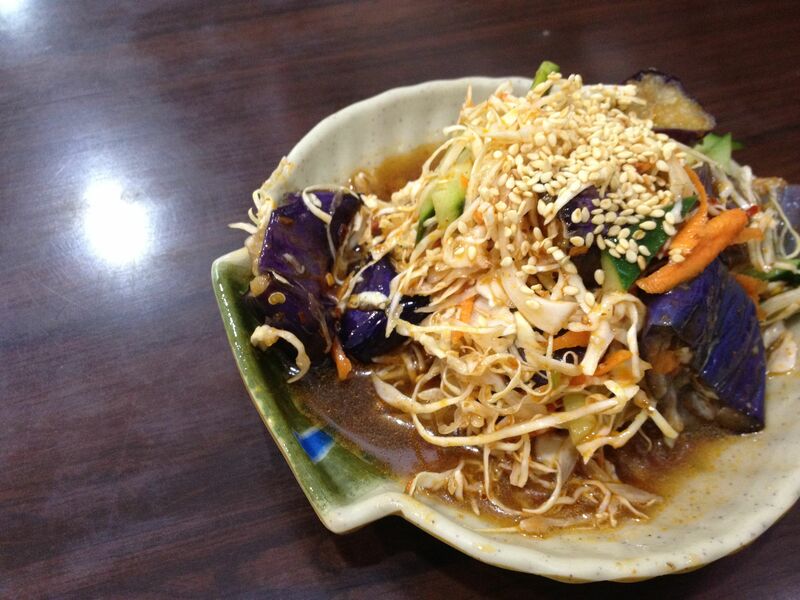 For vegetables we got the mixed stir fried vegetables (綜合炒野菜) for 150NT. 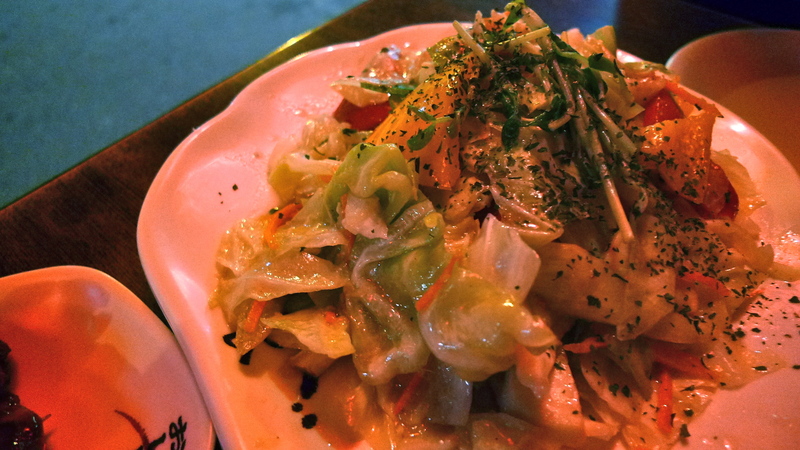 This was a tasty plate of vegetables (cabbage, bell peppers, onions, king oyster mushrooms, carrots, etc.). It was a little on the salty side, but for me that was okay because I like salty foods. The vegetables were cooked perfectly so that they still had a little crunch, which is great because nothing is worse than a plate of soggy veggies. 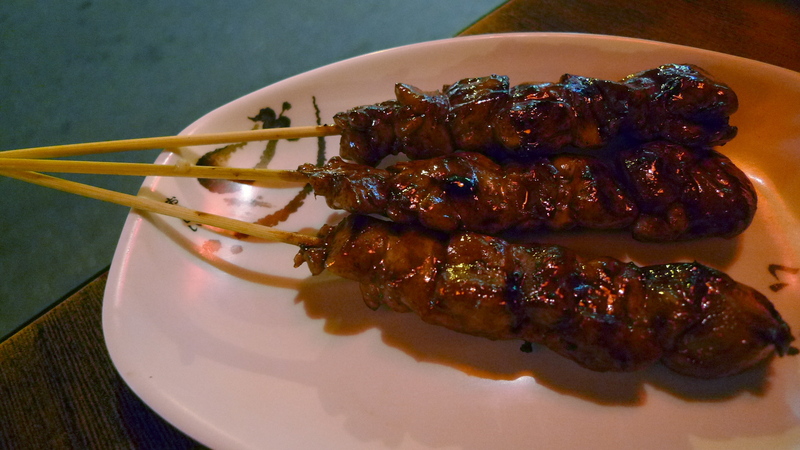 The last thing we added to our order was the Japanese style mushrooms (和風香菇), which comes with 2 skewers (6 pcs.) for 120NT. 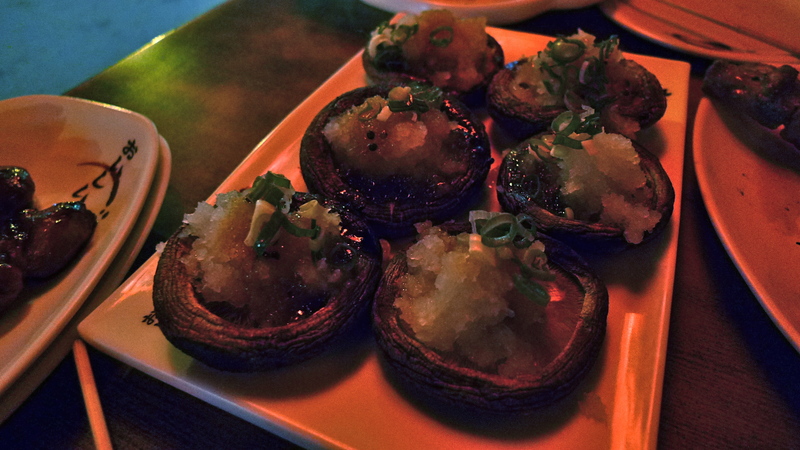 I thought these mushrooms were pretty tasty. 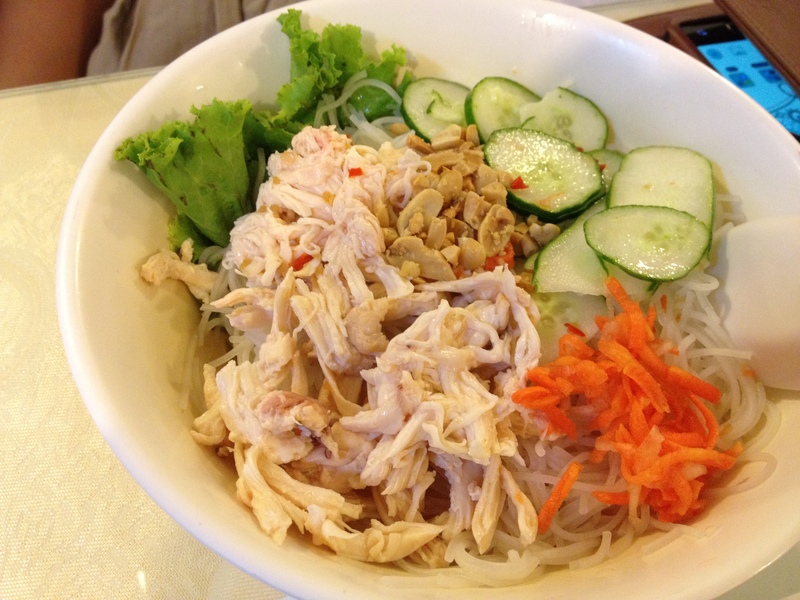 The were grilled then topped with ground radish, green onions, and a sweet and tangy sauce. If you got one without much sauce they were kind of plain, but I still liked it; Ashley did too. 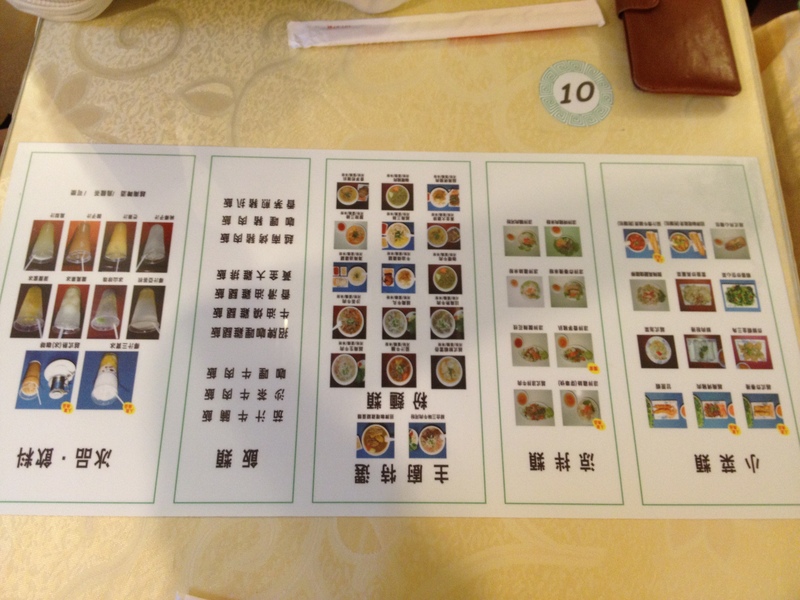 Ashley said that inside the restaurant they have on their most popular dishes up on the wall. I’m not sure if anything we ordered was part of that “most popular” list, but overall I thought it was all pretty damn tasty. 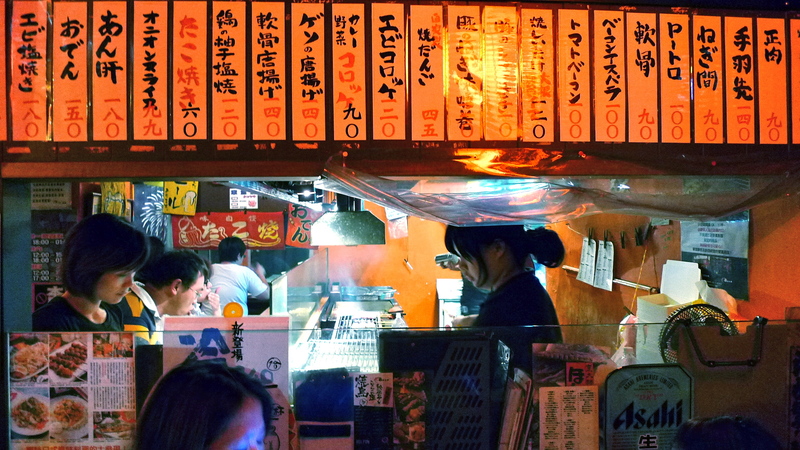 The thing about going to an izakaya, though, is that it can add up quickly price wise. By the end of our meal we had decided that we had ordered the perfect amount of food for two people; our bill came out to 760NT, but we didn’t order and alcohol, so keep that in mind. 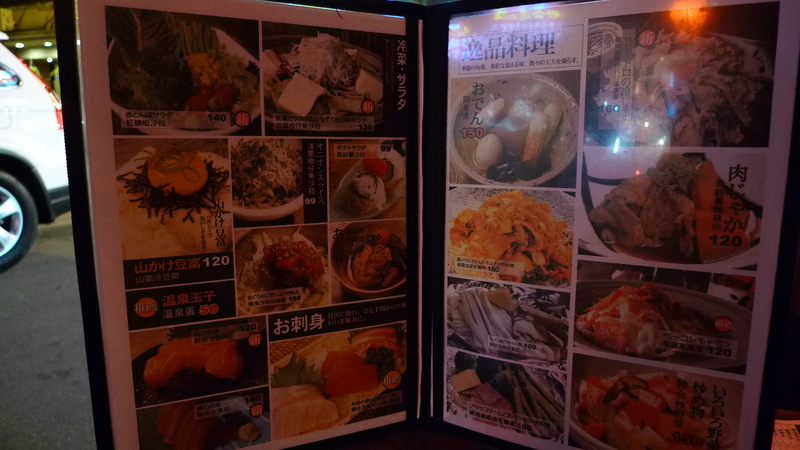 There were a lot of other things I wanted to try on the menu so I will definitely have to go back and try them.